Thank you for coming back to my blog site. In case you have missed any of the previous eight blogs on the Ten Reasons for the Current Heroin Epidemic, please do scroll down to check them out. Today we will be discussing how Mental Health Treatment or actually the lack thereof has contributed to the overall increase in illicit drug and alcohol use, and opiate/heroin dependency. Enough with the statistics! How does this lead to the heroin epidemic? Simply stated, patients with mental illness are no different than patients with a wide variety of complaints – they all want to feel better. However, when there are roadblocks related to funding and access to treatment and medication for psychiatric illnesses, patients look elsewhere to feel better. It is a well-known phenomenon that patients who cannot access care are more likely to self-medicate. So it should not surprise us that patients with depression, anxiety, bipolar illness and other psychiatric health issues reach for drugs that make them feel better: alcohol, stimulants such as cocaine, and opioids such as OxyContin or heroin are commonly used. When I started this blog series, I promised that I would not only assign blame for the Heroin Epidemic, but also offer solutions. 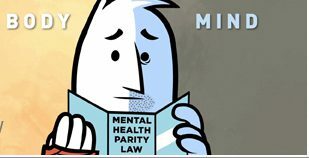 So here is another solution: Federal and State Governments must enforce parity laws and we must increase access and funding for mental illness. As they say in the Midas commercial, “You can pay now or you can pay later, but you are going to pay.” Inadequate mental health treatment can lead to substance use, crime, dysfunctional family dynamics and an overall increase in financial costs to society. Posted in Author Blog. Tags: Addiction Advocacy, Addiction On Trial, Addiction Specialist, Addiction Writer, Author Steven Kassels, Dr. Steven Kassels, Heroin Addiction, MD Author, Medical Legal Fiction, Opiates, Recovery on July 27, 2015 by skassels.